Direct conversion of methane to methanol and other useful fuel and precursors is a challenge that needs to be addressed in order to ensure optimal utilization of shale gas reserves. Selective oxidation, thus far, has only been achieved in nature by bacterial enzymes known as methane monooxygenases. Our goal is to develop a mechanistic understanding of their synthetic analogs – copper-oxo complexes – and determine the factors that control activity and selectivity in these complexes. They constitute a bridge between heterogeneous and homogeneous catalysts, with metal atoms atomically dispersed over support. SACs are promising because they offer both the stability of heterogeneous catalysts as well as the efficiency of transition metal complexes. 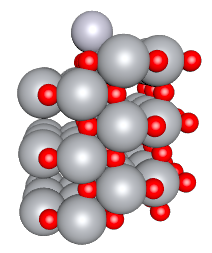 Our goal is to use computations to determine the electronic structure of the metal-support interface, influence of reaction conditions on the catalyst stability, and their consequences on reaction mechanisms. Metal-oxide interactions are also significant in the context of corrosion, an electrochemical process that results in losses of over $1 trillion annually. Our goal is to develop an atomic-level understanding of the metal-oxide interface in corrosion processes, its implications on kinetics, and prevention strategies. In silico design of catalysts is based on the discovery of suitable descriptors that correlate not only structures, but also the electronic structure to activity and selectivity. While these principles are broadly well-established for heterogeneous catalysts, rational design of transition metal complexes remains elusive. Our goal is to draw inspiration from drug design and computational heterogeneous catalysis to use quantum chemistry and machine learning techniques to discover descriptors and design principles for metal complexes.